From I-65 South, take exit 259B to 4th Avenue South. Continue on 4th Avenue South and turn right on to 22nd St South. Turn left into parking lot at the corner of 22nd and University Blvd. Follow I-59 South to 8th Avenue South/University Blvd in Birmingham. Take the University Blvd exit from US-280 East/US-31 South. Turn right onto 8th Avenue South/University Blvd and the destination will be on the right. From I-65 North, take exit 259 to merge onto 8th Avenue South/University Blvd and the destination will be on the left in 1.1 miles. Follow US-280 West to 8th Avenue South/University Blvd in Birmingham. Take the University Blvd/8th Ave South exit from US-280 West/US-31 North. Merge onto 8th Avenue South/University Blvd and the destination will be on the right. Follow I-59 North to I-65 South towards Montgomery. Take exit 259B to 4th Avenue South. Continue on 4th Avenue South and turn right on to 22nd St South. Turn left into parking lot at the corner of 22nd and University Blvd. 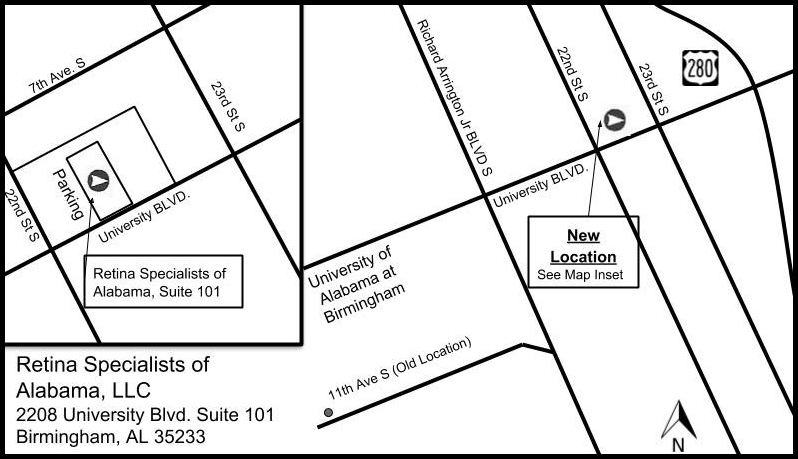 Retina Specialists of Alabama, LLC is located on the corner of University Blvd and 22nd Street South.